Italian Talmudist and publisher: born at Rome at the end of the fifteenth century: died at Ferrara about 1570. He was the grandson of thewell-known physician and astronomer Immanuel Boneto. Isaac occupied, about 1530, the position of rabbi at Avignon (Neubauer, in "R. E. J." x. 80 et seq.). In 1536 he was at Mantua, where he published the Zchar. Thence, for some unexplained reason, he had to flee to Bologna, leaving his books behind him. In 1546 he was manager of the Hebrew printing-office in Rome, and in this capacity rendered many services to Hebrew literature. Family affairs called him again to Avignon in 1558. On his return to Bologna he found himself in very straitened circumstances. 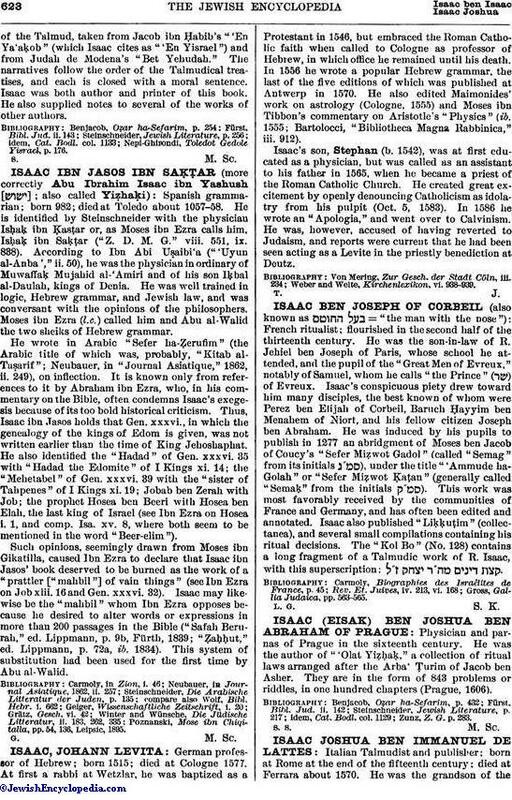 In a letter addressed to one of his friends he complains of his poverty, which prevented him from going to Piedmont or to Lombardy, where Hebrew books were not liable to confiscation, and where he might have founded a Talmudical school and thus secured a livelihood. His chief regret was that he did not possess the 300 scudi he had promised as dowry to his daughter Dolcetta, who was engaged to Laudadio di Sienna. Later, Isaac lived at Ancona and afterward at Cesena, whence he was called to Ferrara by Isaac Abravanel as tutor to his sons. 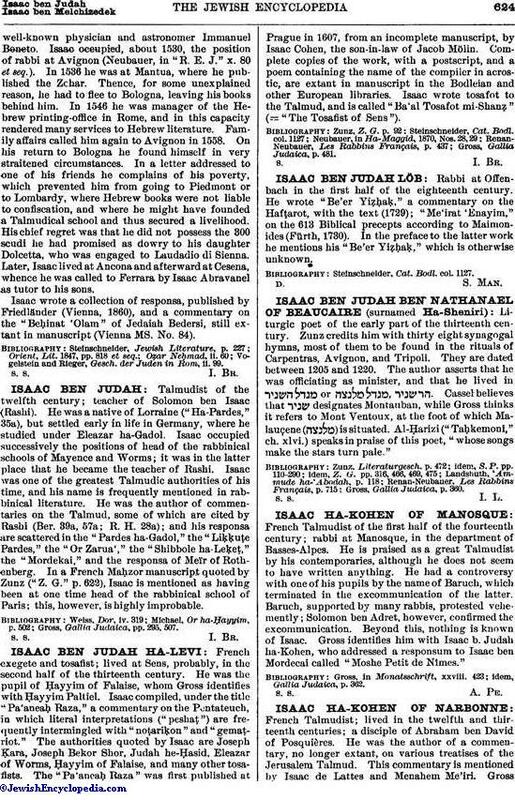 Isaac wrote a collection of responsa, published by Friedländer (Vienna, 1860), and a commentary on the "Beḥinat 'Olam" of Jedaiah Bedersi, still extant in manuscript (Vienna MS. No. 84). Vogelstein and Rieger, Gesch. der Juden in Rom, ii. 99.